A subsidiary print, placed adjacent to the handle, incorporates a hut and a four story pagoda. 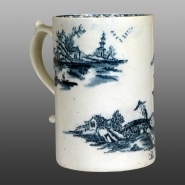 This chinoiserie landscape print is often found on Lowestoft jugs and mugs. It features a tall pagoda behind a wall with an arched gateway; in the foreground is another pagoda and tall trees on a river bank. To the left is a bridge on which is a figure with a parasol. This design appears to be peculiar to the Lowestoft factory. The mug has a painted trellis border.